Boston College saw three players drafted: Eric Campbell from Norwich, CT, Terry Doyle from Salem, NH, and Dan Houston from Palm Beach Gardens, FL who proceeded to lead the Casper Ghosts in wins and ERA. Two drafted athletes played both their high school and college ball in Metro-Boston, including Nate Nelson (Worcester/Worcester State) and Mike Lyon (Wrentham/Northeastern University). The three local high school players drafted all opted to pursue collegiate baseball careers instead of going pro: Blaine O'Brien of Scituate, Scott Weisman of Boxborough and Keith Landers of Worcester. 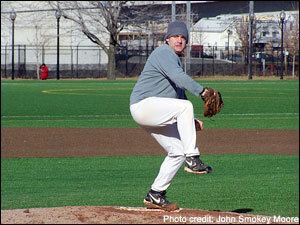 12/13/08: Today at East Boston Stadium, teams from the Boston Men's Baseball League gathered for the 8th time to play baseball in perfect winter weather. With temperature approaching 28 degrees, the athlete's went at it — all in the name of charity. Each participating player brought an unwrapped toy for Toys for Tots as their entry fee. Young Guys beat the Old Guys, 5-3. More on Winterball. 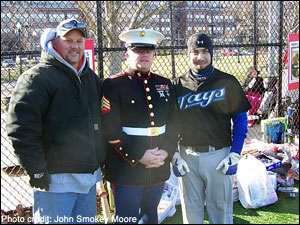 Smokey Moore & Ryan Bere with the USMC. Chris Allen bundled up for his appearance. 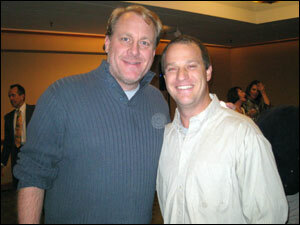 11/20/08: Curt Schilling and his wife Shonda were on hand at the ALS Post-Season Reception at the Hyatt Regency in Boston to honor those who made contributions to Curt's Pitch for ALS, including those athletes who fundraised and participated in the 5th annual 100 Innings of Baseball. Curt also announced that he spoke with Commissioner Bud Selig to turn July 4, 2009 into Lou Gehrig Day across Major League Baseball. "It is the 70th anniversary of Lou Gehrig's speech. We are working on an initiative to make July 4 Lou Gehrig Day in Major League Baseball this year. That will get a lot of my effort." You can bet that many across the Boston Baseball community will be assisting in this initiative. 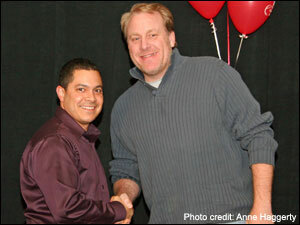 Top fundraiser, Ish LaBoy, honored by Curt Schilling at ALS Gala. Local player and ALS Boardmember, Kevin Krueger with Curt. 11/20/08: Boston Amateur Baseball Network Founder, Brett Rudy, recently made an appearance on the Baseball Heads Show to promote current baseball charitable initiatives and ways to bring ballplayers across the Boston Baseball community closer together. Topics discussed with Yawkey League host Dave McKay included Winterball, 100 Innings of Baseball and The Network. Those living in Boston or Brookline can tune into Comcast, Channel 12. 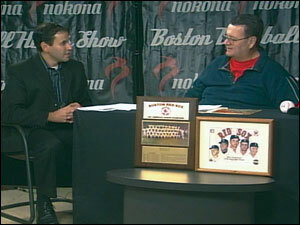 BABN's Brett Rudy with Yawkey League prez, Dave McKay on Baseball heads Show.